Traditional email apps come with consumer trust for established brands and familiar interfaces. But due to their age and limited changes to design, they also unfortunately often come with cluttered interfaces. Filters that organize your email inbox are one option. But for users who don’t want an information overload from a crowded screen, a minimalistic option can be less overwhelming and more convenient. Here are five apps that will give you a simpler inbox free from clutter. Formerly called CloudMagic, Newton has been in headlines in recent weeks after the developers decided to ditch the Sent folder to make the app more streamlined. And if experience with the app tells us anything, it’s that the creators of Newton definitely know how to streamline. As a relatively new app, Newton isn’t bogged down by the need to keep the interface familiar to users who have had the product for over a decade. While Google recently introduced it’s new look for Gmail, it is still quite similar to what came before. Newton’s creative freedom means that it has a sleek appearance. It also packs in loads of functionality without cluttering the user’s screens. A very useful tool not found in other apps without adding extensions is the blue tick read receipts. The ticks are similar to Whatsapp’s own blue ticks and will tell you whether an email has been opened. Integration with apps such as Evernote and Trello, snooze functionality, email scheduling and even an ‘Undo Send” option are part of the apps many features. The “Tidy Inbox” function also automatically sends all newsletters to your Low Priority folder so that you can focus on emails that are important. Meanwhile, the Low Priority folder gives you instant options to delete all mails or bulk unsubscribe from newsletters. On the mobile app, using different swiping gestures will help you get through your inbox easily by deleting, archiving, snoozing and moving emails. Other handy tools include reminders for mails that haven’t received a reply and one-tap unsubscribe. So what are the drawbacks of the app? Well, all this functionality and design doesn’t come for free. While you can get a 14-day free trial to try out the app, to use it in the long term you will need to pay an annual subscription fee of up to $49.99. The developers at Edison claim that their app (formerly called EasilyDo) is the fastest email app on Android. But it is also one of the popular free alternatives to Gmail. Speed is definitely a noticeable feature of the app, but so is its clean design. When viewing an email, most of your options are presented as icons. You also use swipe gestures to sort through your mail quickly. Similar to Gmail, it has a quick reply feature that lets you respond to emails instantly. But Edison’s Assistant feature is what makes the app stand out. This feature can sort through emails of different types, such as travel bookings, purchases, and waybills. It also has a unique feature that you can use to check whether your account is secure. Just like sites like HaveIBeenPwned, it can check whether your email account has been involved in any data breaches. The app also includes some of the features seen in premium email apps, such as a snooze email function, undo send, and TouchID. There are a few downsides to the app, however. It doesn’t automatically sort newsletters from general emails. Despite this, there is an automatic unsubscribe button at the top of newsletter emails that is very handy. Your email threads are also very easy to sort through because of the minimalistic presentation. Listed in reverse chronological order, even the longest thread of emails becomes easier to search through thanks to the clean interface. The major selling point of ProtonMail is that it is a secure and encrypted email app with privacy at its core. However, it is also a very sleek and clutter-free app that makes browsing through your emails simple. Unfortunately, only the paid version of the app allows you to bridge an existing email account such as Gmail with the app. Creating your own email account under the ProtonMail domain is free, but custom domains are part of the paid version too. If you’re looking for something different, and more importantly, secure, then ProtonMail may be the email app for you. In addition to its end-to-end encryption, it includes the ability to create expiring emails which become inaccessible after a certain period of time. You can also assign a password for individual emails sent to users of different mail clients. In terms of productivity, it has the minimalistic design of modern email apps—without ads and unnecessary additions that clutter other apps. You can create labels, new folders, and filters. The downside? Well, ProtonMail is so focused on privacy, that if you have to reset your email password, every email in your inbox from before the date of the reset becomes inaccessible. You will therefore need to keep your password somewhere safe so that you don’t run into this situation. 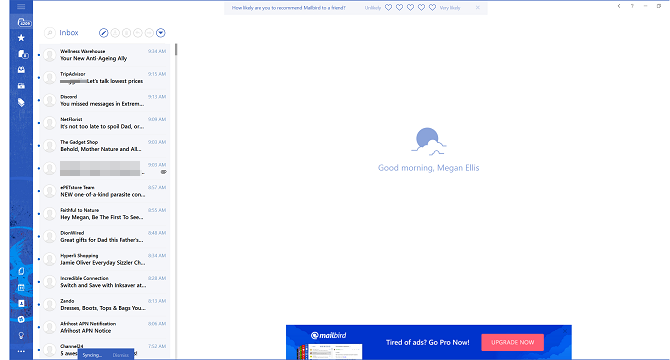 Mailbird is a Windows email app that packs in a surprising amount of functionality, even in the free version. Its app integration is extensive, allowing you to create tabs that host your favorite apps within the mail client. Apps include Slack, Google Keep, Todoist and even Whatsapp. You can also adjust the app’s layout to a variety of available themes or upload your own one. The app has a clean layout, using icons for different tabs in a minimized menu. You can customize it further to suit your layout preferences. As part of its productivity features, Mailbird includes a speed read function to help you sort through your emails faster. You simply select a certain words-per-minute speed and single words will appear on your screen. This helps you fly through your emails and get to the coveted status of Inbox Zero. You can also incorporate your Gmail account’s shortcuts, which eases the transition between the two clients. BlueMail doesn’t have the level of organization tools and clutter management as some of the other apps on this list. But it is one of the few that is completely free and offers a sleek appearance. It doesn’t separate your social and newsletter emails into a separate tab or folder—but there is the option to switch to people mode by tapping a slider near the top of the app. This means that you will only see emails from actual people (rather than websites), letting you focus on emails that need a response. The app includes a high level of customization in terms of appearance and design, giving users the freedom to tweak it to their preferences. It also has calendar and task list integration, which is always a handy feature. Other useful features of the app include one-tap unsubscribe, undo send and customizable gesture controls. Apps like these help boost your productivity by making it easier to sort through your emails. But there are many other ways you can improve your productivity across different spheres of your life. If you’re interested in getting your daily life more organized, make sure to check out our guide on simple tips to improve your productivity.